Offering the lowest pay-as-you-play rate in the Valley for 18 holes with a cart! VIP Pricing good for card holder only. Card must be presented at time of transaction. Not valid with any other offers - Not transferrable. Card expires one year from purchase date. --10% discount on regularly priced Pro Shop merchandise. Some brand restrictions apply. 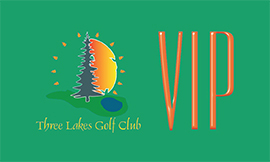 --Participation in the Three Lakes Rewards program. --Corporate Season Pass options available.